As Bob Dylan once sang, "the times, they are a changin'." So, too, is Godzilla. As depicted in SHIN GODZILLA (Japanese title: Godzilla Resurgence), the Japanese film icon is no longer the a-bomb spawned, fire-breathing giant dinosaur we've come to know and love in a series of films that began in 1954. In a deviation from tradition arguably as drastic as that taken by Roland Emmerich and Dean Devlin in their much maligned 1998 American version of GODZILLA, the erstwhile "King of the Monsters" has been re-imagined as an ever mutating and evolving sea creature. Rather than an atomic bomb blast being responsible, it's implied something along the lines of the Fukushima Daiichi nuclear plant disaster is the culprit. This, and other exposition, is delivered in frenetic, almost documentary style as we meet various government officials and see their responses to increasingly strange and catastrophic events. A boat is attacked, a tunnel is ruptured, and video footage seems to show some sort of creature is involved. But only Deputy Chief Cabinet Secretary Rando Yaguchi (Hiroki Hasegawa) is willing to go with that theory right away. Most members of the government convince themselves that it's some kind of volcanic activity. Once the creature makes landfall, however, its existence can no longer be denied. At first looking like a squirming tadpole with gills on its sides and spiky fins on its back, the creature soon mutates and begins standing upright, unleashing considerable death and destruction before heading back to the water. Government officials are convinced the creature can't stay on land very long, but of course they are proved wrong when it returns and mutates into a more familiar, Godzilla-like form. The military is called out to little effect, so when the United States offers to help in exchange for access to the monster after it's killed, the Japanese government grudgingly accepts. But it's kind of a moot point as Godzilla has little intention of going down easy. In fact, when the U.S. sends bombers in to attack Godzilla, all they accomplish is to piss it off to the point it unleashes a blast of fiery breath and radioactive laser beams that shoot out of its spikes. With this, Godzilla destroys damn near half of Tokyo in one shot. The blast takes a lot out of the big G, though, and it has to hibernate to recharge. The result, story-wise, is that Godzilla literally sleeps through half of its own movie. It's an odd choice, but thanks to a more compelling human story than is typical for one of these films, it doesn't prove fatal. The film is very much a commentary on modern Japanese politics, and the relationship between Japan and the U.S. that has largely remained the same since the end of the second World War even as the world has changed drastically. One example of that is that the U.S. isn't represented by the usual white male B-movie actor you would have found in one of the old Godzilla films, but by Kayoko Ann Patterson (Satomi Ishihara), the Asian-American special envoy to the President of the United States who hopes to hold her boss's position some day. Don't worry, though, monster fans. Eventually Godzilla wakes up, and when it does, it isn't in a very good mood. Many people, myself included, complained that Gareth Edwards American GODZILLA reboot of 2014 was disappointing because there was so little actual Godzilla in the film. One could just as easily lodge that complaint here. The difference is that in SHIN GODZILLA, the non-monster material is serious-minded and genuinely compelling. Still, it's almost certain that this film will split Godzilla fans. It's so drastically different, it's bound too. 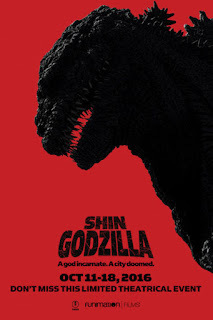 And yet, despite those very real differences, by returning to the somber tone and social commentary that made the original 1954 GODZILLA a thoughtful and genuinely scary film, SHIN GODZILLA in a way returns Godzilla to its roots. It also bears mentioning, especially if you're thinking about taking the kids to see this, that SHIN GODZILLA is presented in the Japanese language with subtitles. I viewed it with my 5 year old son and his 6 year old, Godzilla-crazed friend. My son couldn't hang. His friend did, but was unhappy with some of the changes made to his favorite character. 3 out of 4 stars.